AT A TIME when most kids were organizing their stuffed animal collections, Hannah Wicklund was assembling a guitar pedal board. The South Carolina native and founder of all-American rock ‘n’ roll band The Steppin Stones has been playing guitar since she was eight and booking gigs since age nine. Nine years since her stage debut, Wicklund has left her Hilton Head home and made the leap to Nashville, devoting herself fully to her band and craft. Savannah gigs were crucial to The Steppin Stones’ early years—the band was a City Market favorite—and, while she appreciates everything she learned in her time in the Lowcountry, Wicklund’s loving the challenge of life in Music City. She’s been finding her place in the scene since August. While the power trio made the move together, Wicklund is now the sole original member of the band after the other members amicably departed. As she works toward a new album, Wicklund’s writing on her own, as she usually does, but her new hometown has also allowed her to network and collaborate. As a musician, Wicklund is a triple threat: a songwriter with a penchant for classic rock bravado and blues grit; a vocalist with a killer range and warmly raw style; and, first and foremost, a complete shredder of a guitarist. When she began, Wicklund learned all the iconic classic rock hits verbatim, playing solos note-by-note and following tabs. That foundation allowed her to take risks onstage and explore her instrument. Playing as a three-piece pushes her to fill out space and pull a variety of tones from her guitar. “I use a lot of open strings, and I’m not really afraid to make it sound kind of muddy at times,” she says, citing Jimi Hendrix and Jeff Beck as her primary influences. Throughout the years, Wicklund’s had a pretty consistent gear setup, playing a custom Tom Anderson guitar (her favored model since she was 9) and a pedalboard armed with essential effects. This summer, Wicklund will hit the studio with a new bassist and drummer to record a fresh Steppin Stones record in Nashville. She explains that, while it boasts the Steppin Stones timeless rock ‘n’ roll sound with a blues edge, the band’s style has evolved since their second full-length album, released in 2015. 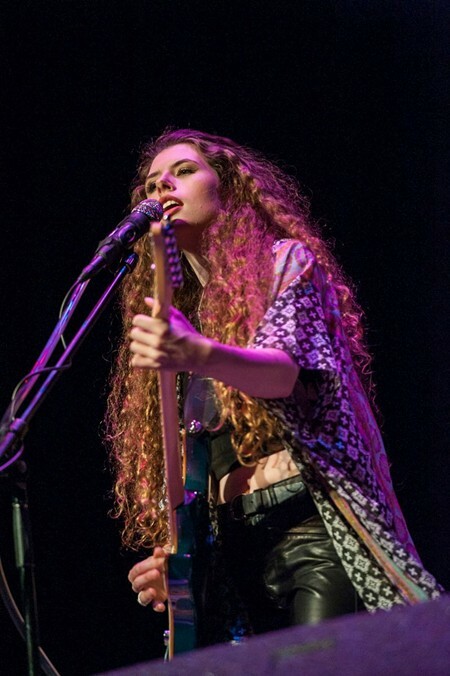 It’s going to be a busy spring and summer for Wicklund—when she’s not writing or recording, The Steppin Stones will be on the road, hitting festivals like Sweetwater 420 Fest, The Peach Music Festival, and KAABOO Del Mar in San Diego before embarking on their first European tour. Even on lineups like KAABOO, which features juggernaut headliners like Tom Petty & The Heartbreakers, Red Hot Chili Peppers, and Muse, Wicklund isn’t intimidated—the fearless frontwoman’s been preparing for this moment her whole life.